The Torre Latinoamericana (English: Latin-American Tower) is a skyscraper in downtown Mexico City, Mexico. Its central location, height (188 m with 44 stories) and history make it one of the city's most important landmarks. It is also widely recognized internationally as an engineering and architectural landmark since it was the world's first major skyscraper successfully built on highly active seismic land. The old skyscraper withstood the 1985 Mexico City earthquake without damage. The Torre Latinoamericana was Mexico City's tallest building from 1956, when it was built, until the 1984 completion of the Torre Ejecutiva Pemex, which is 22 m higher (although, if one subtracts the height of the television transmitter atop the Torre Latinoamericana, it had already been surpassed in 1972 by the 207 m-tall Hotel de México, which was subsequently remodelled and turned into the World Trade Center Mexico City). It is situated on the corner of the Eje Central and Madero Street. Foundation works starts in 1949 with 361 pylons at 33 meters deep for a total weight of 24,100 metric tons, the four facades have 15000 sq meters of glass & 3200 sq. meters of aluminium. The project was designed and executed by Dr. Leonardo Zeevaert and his brother Adolfo Zeevaert, Mexican civil engineers born in Veracruz. Prof. Nathan M. Newmark, of the University of Illinois was the main consultant. Its design consists of a steel-frame construction and deep-seated piles, which were necessary due to the Mexico City's frequent earthquakes and muddy soil composition, which makes the terrain tricky to build on. Before construction, both engineers carried out a number of soil mechanics studies in the construction site, and designed the structure accordingly. Today this is a mandatory practice, but at that time it was quite an innovation. The tower gained international attention when it withstood the 1957 magnitude 7.9 earthquake, thanks to its outstanding design and strength. This performance resulted in a recognition in the form of the American Institute of Steel Construction Award of Merit for "the tallest building ever exposed to a huge seismic force" (as is attested by plaques in the building's lobby and observation deck). Interestingly, this building experienced another bigger earthquake during September 19, 1985, with a magnitude of 8.1, which destroyed many buildings in Mexico City, especially the ones built downtown, in the tower's neighborhood. 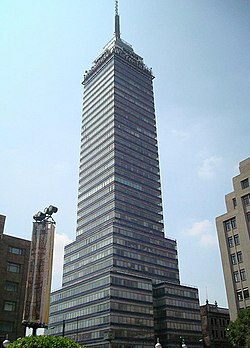 The Torre Latinoamericana withstood this force without problems, and has thus become a symbol of safety in Mexico City. Today the tower is considered one of the safest buildings in the city despite its potentially dangerous location. While it was being built, detractors said that there was no way a building of that size could withstand one of Mexico City's earthquakes. There is a legend that on the day of the 1957 earthquake, Dr. Leonardo Zeevaert was inspecting something or other on the roof of the tower, and that he got to see and feel how his tower withstood the quake while the surrounding buildings collapsed. The truth is that during the September, 1985 earthquake, which took place at 7:19, Adolfo Zeevaert was already inside his office on the 25th floor. From that vantage point he was able to witness the destruction taking place while several buildings collapsed and the dust cloud that followed, all the while feeling the movement inside the tower. It could arguably be said that it was the first time that a builder and designer of a tall building witnessed firsthand its behavior during a massive earthquake. Awarded on 1957 by the American Institute of Steel Construction by their great response on seismic phenomena by their strongness & integrity of their modern steel structure. Included on 1997 into the catalog of the National Institute of Fine Arts (INBA) as a monumental building representative of their time of construction supported on the Federal Law of Monuments & Archaeologic Zones Artístic & Historic. Posted: Thu Jul 09, 2015 8:16 pm Post subject: If we do it right , High Rise bldgs. will survive/stand. This is very useful post, knowing that if you do it right, the High Rise Buildings will survive Seismic Events of Greater Magnitude than Bhuj Earthquake and recent Nepal Earthquake. Thanks for posting an interesting note on the tall steel building in Mexico City which has withstood two severe earthquakes without damage. The design of this tall building in steelwork as an earth-quake resistant structure, has given a boost to the steel industry as a whole, particularly in USA, as there is always a competition between steel and concrete in their usage for the tall buildings. Rightly, the American Institute of Steel Construction has awarded the structure for their great response on seismic phenomena by their strongness & integrity of their modern steel structure. I always feel that steel structures should be used in EQ zones as steel is more ductile and equally strong in tension and compression. Moreover steel fabrication is usually done in shop with more qualified persons and the quality control is better. We can use BRBs and Steel plate shear walls too.